There were two nearly identical hate crimes in 1908, where a Chinese man was attacked without cause by a white man. Were the assaults connected? As these are the only similar incidents I've encountered in studying 5+ years of the Santa Rosa newspapers in that era, chances of a coincidence are low. Yet the attackers were in different towns and probably did not know one another; one was a "brawny iron worker," and the other was apparently a farmhand. Look instead for a link in what they read; the newspapers that month were salted with anti-Chinese rhetoric that invited ridicule and hate and fear. The first unprovoked attack happened in a Sebastopol restaurant. Johnny Poggie (who we know through the census was then a 25 year-old farm worker) and Tom Mason were arrested for smashing a brick into the head of Gee Chung. The next day, the Santa Rosa Republican turned it into a humor item, starting with the racist headline, "Men Hit Chink With Brick." After noting the injury "may be serious," what followed was in the colorful writing style usually reserved for describing the comical mishaps of drunks. "When the Celestial opened his purse to pay for the dainties he had consumed, Mason is alleged to have struck him on the head with a brick. Chung sank to the floor, and 'subsequent proceedings interested him no more.'" Would the newspaper have treated this unprovoked attack so flippantly if the victim had been white? Of course not (read update here). Then less than two weeks later, the scene of Chinese restaurant violence was in Santa Rosa. This time, a "most brutal beating" by an unknown construction worker was reported by the Republican newspaper with far more restraint (although the writer slipped in that the victim's black eyes were the color of "a deep mourning"). Did the more straightforward tone on this story reflect editorial remorse that the paper might have had some role in inciting the earlier violence? The Santa Rosa attack could have been a copycat inspired by the Sebastopol assault, but left hanging is the larger question of why Chinese men were now suddenly at risk of being beaten - even killed - while eating at a restaurant. For that answer, you only have to read the fearmongering that was appearing in the big city papers about the tong wars. That month saw another flareup in the seven year feud between the Hop Sing and Ping Kung gangs. Before the first restaurant attack, two men had been gunned down in Oakland's Chinatown; another pair were killed in San Francisco's Chinatown before the second assault at a local restaurant. All four victims died while the gangs were supposedly under a truce, a violation of honor surely not lost on Chinese-hating bigots. 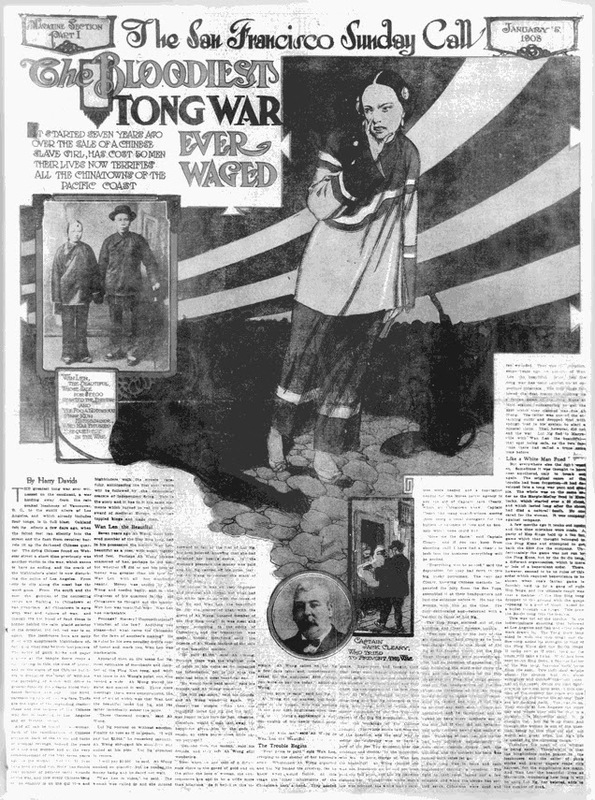 The frequent newspaper stories about Chinatown murders was enough to make anyone nervous about visiting those neighborhoods, but a lurid feature article in the January 5, 1908 San Francisco Sunday Call Magazine went further to warn that no place on the West Coast was safe from the "indiscriminate shooting" of the murderous gangs. "It looks now as if every tong on the coast will take a hand...they are all flocking back. The war is on. They struck at Los Angeles the other day and where they will be next is a mystery." The greatest tong war ever witnessed on the continent, a war holding sway from the rain soaked josshouses of Vancouver, B. C., to the sunlit alleys of Los Angeles, and which already includes four tongs, is in full blast. Oakland felt its effects a few days ago, when the felted feet ran silently into the street and the flash from revolver barrels lit up the darkened Chinese quarter. The dying Chinese found on Webster street a short time previously was another victim to the war, which seems to have no ending, and the crack of the highbinder's pistol is now disturbing the police of Los Angeles. From city to city along the coast has the word gone. From the south and the east, the gunmen of the contesting tongs are flocking to Chinatown of San Francisco. All Chinatown is agog with war and rumors of war, and though the hot blood of feud times is hidden behind the calm, placid exterior of the oriental, the red, red war is on again. The Hop Sing-Ping Kung feud, which had caused scores of deaths, actually ended a few days later, just before the start of the Chinese New Year (a celebration that the Press Democrat described with condescension and mocking humor). Key to the settlement was the threat by San Francisco's Chief of Police, W. J. Biggy, to prohibit New Year festivities and "turn loose" a special police squad on Chinatown to expel from the city anyone considered suspicious. Although the tong wars sometimes reached into Sonoma county, there were no reports of violence upon local Chinese people in this period. Except for the two restaurant attacks by whites, of course. Tom Mason and Johnny Poggie, residents of Sebastopol, were landed in the county jail here Wednesday afternoon by City Marshal Fred R. Mathews of that city. The men are charged with an assault on Gee Chung, a Celestial of Sebastopol. The alleged offense occurred in a Chinese noodle joint in the Gold Ridge city on Tuesday evening and as a result Chung is laid up with a badly battered head. His injuries may be serious. The two men under arrest are alleged to have gone into the restaurant to partake of noodles, and the Chinese were also feasting on the same dish. When the Celestial opened his purse to pay for the dainties he had consumed, Mason is alleged to have struck him on the head with a brick. Chung sank to the floor, and "subsequent proceedings interested him no more." Tom Ling, a Chinese, was badly beaten Sunday evening by one of the iron workers employed on the construction of the new court house in this city. The assault occurred in a Chinese noodle joint, and the Celestial was given a most brutal beating by the brawny iron worker. Ling swore to a warrant Monday morning for the arrest of his assailant whose name is unknown. Justice Atchinson issued a John Doe warrant for the arrest. The Chinese had both eyes blackened, the color of each being a deep mourning, his head was severely cut and a large knot was raised on his forehead. The assault is declared to have been an unprovoked one. DID YOU KNOW THAT IT IS NEW YEAR'S DAY? Chinatown was busy yesterday, and later on there was a sound of revelry by night. The percussion band rendered a long list of the compositions of the Chinese Wagner, completely drowning the customary melody of Mr. Thomas Cat, who does solo work on the housetops of Chinatown. It was the beginning of the New Year celebration; for this is New Year's Day. The Chinaman begins his celebration the day before, and sometimes he makes it last a week. He has good reason; for it is the only holiday time he has. There is no Chinese Fourth of July; no Christmas; no Memorial Day; no Thanksgiving; no Admission Day--not even April Fool. So for several days the tintintabulation of the brass gong and the wooden drums will smite the ears, and the smell of gunpowder and punk-sticks will assail the nostrils of those who visit the Mongolian quarter. If you have nothing to do today and time hands heavy, you might go down to Second street and see the celebration. The punch, "Manderin's Delight," has been brewed already, and you'll be invited to drink. That will give you something to do and something to thing about for a long time. One man who went there and had some punch last New Year's day sat up in a drug store all night, eating quinine with a tablespoon, trying to get the taste of the punch out of his mouth.